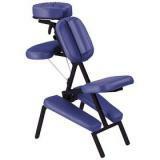 Massage Chair Reviews – This Master Massage massage chair is built with a frame made of lightweight aircraft aluminum, which is super light in weight and also very strong. It has a carrying case for you can carry your chair anywhere you want. The case has luggage style wheels, which makes it easy to move around.